An old story tells us that when the Maya Indians of Guatemala had worries they would tell them to the worry people who would take the worries away. 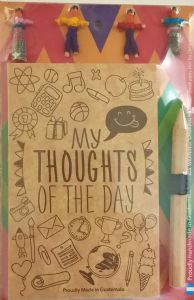 Write down your thoughts and worries in this notebook and it will help to take your worries away. Use this note books to write down your worries so you can let them go, or to make notes on so you don't have to keep reminding yourself of things you need to do. The notebook comes with a pencil and has 4 different worry people attached to the front. It also has a hole so you can fix it to a wall.